Scientific research is often the only hope for patients affected by rare diseases, especially when it brings to drug development, but this is a very complex process that requires not only the basic science development but also the ability to create a final product and to test it. Without expert assistance in navigating the path of drug discovery, even the most promising research advances often do not realize their potential to become major medical breakthroughs. There is a gap, a so-called “valley of death” between discovery of promising new compounds and proof of their safety and efficacy in humans. The creation of a Centre for Therapeutics Discovery (SCTD) in Switzerland is supposed to provide the bridge between basic academic discovery and industry-quality drug development support. The initial strategic focus of the Swiss Centre for Therapeutics discovery will be on rare and orphan diseases. Any basic scientist, working in Switzerland, Europe or in any part of the world is eligible to submit proposals to the SCTD. Scientists joining as fellows and providing expertise to SCTD will keep the scientific ownership of their projects. This center will be a unique place where all Swiss and European rare diseases stakeholders (public and private) will meet to develop new drugs and treatments for patients. The “Swiss Centre for Therapeutics Discovery” (SCTD) will be a no-profit open innovation platform dedicated to translational science on rare diseases and will be located at Campus Biotech in Geneva, Switzerland. 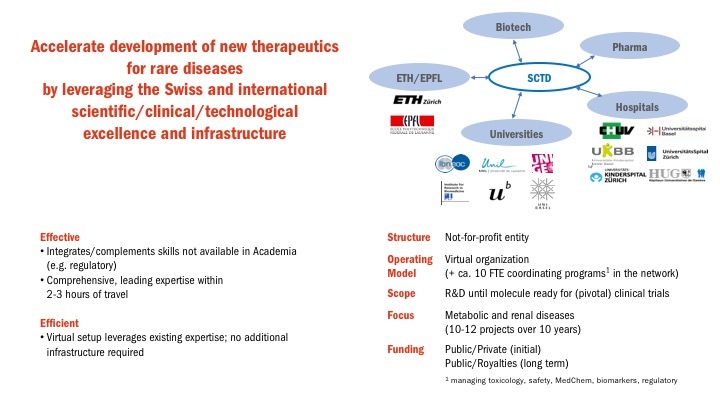 The SCTD objective is to foster novel therapeutics (drugs like small molecules, antibodies, peptides or gene therapy and diagnostic tests) discovery and development to capitalize the available structures for drug discovery and to translate the potential of the basic science performed by the Swiss research centers into treatments for patients. This will be achieved with participating/collaborating clinical centers up to Phase 1. Creating an incubator for therapeutics discovery and research development combining academic expertise of excellence and technologies to discover and develop treatments and diagnostic tools for rare diseases. SCTD focus has been selected to tackle the vast unmet medical need of rare diseases to create drugs with a high impact on patient life independently from projected business case and purely based on science. Research focus will complement big pharma effort on rare monogenetic diseases. Introduction of large scale sequencing to normal subjects and hospitalized patients is currently creating a mass of data (Big Data) that will be pivotal in assessing targets and pathways relevant in diseases affecting the vast majority of the population. Availability of such technology will also create a fractionation of these so called “common” diseases in small subgroups characterized by a very specific genetic fingerprint. The same approach we intend to adopt today in the SCTD to identify treatments for rare diseases will be likely applied in the future to such subgroups. In that sense, working today on rare is working on tomorrow’s common diseases. In that perspective, the SCTD will perfectly fit into the future Health2030 “Personalized Medicine” initiative. It’s well recognized by all actors in pharmaceutical R&D that innovation resides mainly outside Pharma. R&D sector has seen worldwide a pronounced contraction of resources allocated by Big Pharma with a progressive shift toward a search & development (S&D) model. SCTD would like to empower this academic innovation retaining and expanding Academic translational and pharma R&D expertise in Switzerland. Moreover, an academic driven institution like SCTD will be an essential interface between genetic patient information collected in the hospitals and the drug discovery and development business world. The SCTD aims to fill the gap between the public funded basic science research and the industrial supported applied R&D allowing the Swiss and world scientific community working on a specific mechanism, target protein or process involved in a disease onset or progression to move their research from the bench to the bedside. This will be achieved with collaboration with the clinical centers up to Phase 1. SCTD business model will foster the collaboration between the academic research institutions, hospitals, universities or Federal institutes of technology to create a culture of translational research. Mature projects and/or assets will be spin off to fertilize the Swiss biotech environment. SCTD aims at contributing to continue education and professionalization of PhDs, Postdocs, MDs, or MD PhDs interested to move toward roles within the Pharma & Biotech professional world as well as provide complimentary education for healthcare professionals, patients and citizens in the era of personalized healthcare & precision medicine. The SCTD will be operating in total independence. Independence is a key aspect of the SCTD. Philanthropic funding contribution is the engine of such independence. Independence from venture capitalists (VCs) and the pharmaceutical industry funding support will allow to prosecute two key objectives of the proposed center: a) “follow the science” and b) prosecute project even when a single patient is concerned. Independence is a fundamental element to introduce and funnel innovation, generated within and outside the rare disease community into the activity of SCTD. Uniqueness of the SCTD compared to the existent scientiﬁc landscape will be the possibility to couple that innovation with the possibility to prosecute pioneering drug discovery and development projects also when a small population is concerned.